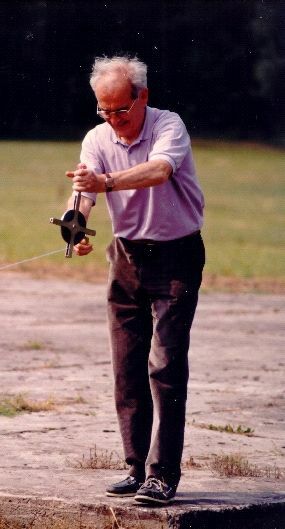 Dr. Robert Faurisson in Treblinka, June 1988. With regard to the wartime Treblinka camp, I have mentioned over the years - in a few conference addresses, in a video presentation, and in some correspondence - the testimony of Marian Olszuk. But because I have been absorbed in the ordeal of the revisionist struggle over the past 15 years, I have put off writing a report about my meeting with that exceptional Polish witness. My report should, more generally, also deal with the journey in 1988 that took me first to Treblinka-Małkinia in Communist Poland and then to the camps of Oranienburg-Sachsenhausen and Ravensbrück in Communist Germany. Ernst Zündel had a set of seven videos about my visits to those three camps. I don't know if those tapes were destroyed in the 1995 arson attack that devastated much of his big house in Toronto, and I will not ask him about that, since right now he is being held in a high security prison in Canada. In addition to that, I still have some 30 photographs that bear witness to my on-site investigation of that shrine of the 'Shoah,' Treblinka. 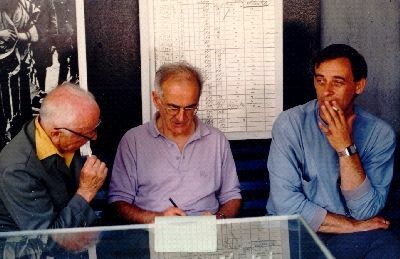 Two men accompanied me during that on-site investigation in June and July of 1988: the German Tijudar Rudolph and the young Canadian Eugen Ernst. The former was kind enough to serve as interpreter and draftsman, while the latter was our cameraman and photographer. I express my thanks to them here for their dedication, competence, and spirit of sacrifice in an adventure that was to prove difficult, with exhausting days of work, bad accommodations, and some troubles caused by the Polish Communist authorities. I also thank my friend Ernst Zündel for having covered our travel and accommodation expenses. My normal investigation method consists of, first, assembling as much documentation as possible on a given subject, then to get away from the writings or records, which are so important to those whom I call 'paper historians,' and, finally, to visit and inspect first-hand the place I am investigating. After a prolonged examination of the site, I look for witnesses in that area. In my questioning, I generally try to be direct and insistent and to avoid conveying even a hint of shyness. Although I am interested in witnesses of all ages, social positions, and points of view, I have learned through experience that in an investigation of this kind it is best to find witnesses who are as non- intellectual as possible and who were no more than 20 years of age at the time of events in question. That 1988 on-site investigation, I should mention, was hardly my first of the kind. During the 1960s, I had already carried out a delicate, even dangerous investigation of the summary executions carried out in the summer of 1944 by the 'resistance fighters' or 'terrorists' in a very limited area of the French département of Charente (between the cities of Angoulême and Limoges). I had questioned Communists and non-Communists about incidents they preferred not to discuss. During the 1970s, I conducted some other difficult investigations that led me, as Montaigne wrote, to "rub and grind [my] brain against another's" and which got me to shed any remnants of shyness. Those experiences were a 'school' for me that, I believe, taught me to size up the real value of a witness and his testimony. From that standpoint, I was fortunate to find, during my 1988 investigation of Treblinka, a witness of exceptional quality. At Treblinka, it was my good fortune to find Marian Olszuk. An exceptional witness, and indeed a guide. 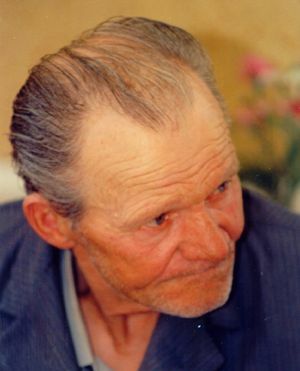 Born in nearby Wólka Okrąglik, he was 63 years old. In 1942-43, the period I was investigating, he was 17 and 18 years of age. 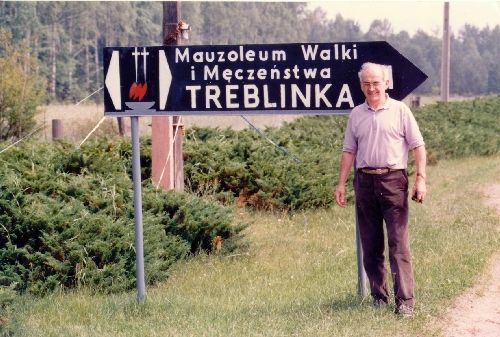 One could hardly imagine finding anyone who might have lived closer to the two Treblinka camps. From December 1941 to July 1944, the Treblinka I camp, located quite close to a sand and gravel quarry that supplied Warsaw, was a prison camp mainly for Poles, both Jewish or non-Jewish, who had been found guilty of breaking laws of the German occupation authorities. The nearby Treblinka II camp was, from July 23, 1942, to October 14, 1944, a camp reserved for Jews, mainly Jews from Warsaw. According to legend, this was, in the jargon of the Allies, an 'extermination camp.' According to the Encyclopedia of the Holocaust, at least 870,000 Jews were exterminated there over a nine-month period, from late July 1942 to April 1943. Even though, of course, he never entered the camp area, every day people gathered in groups outside the front gate, openly engaging in barter and black market dealing. Traffickers came from Warsaw to sell goods to the Ukrainian guards who, in turn, would do business with the Jewish prisoners to whom they sold food. Some of those Jews bought ham and sausages, which were luxury items at that time. The existence of the two camps at Treblinka was common knowledge, and a good many of the Jewish inmates seemed to have money, gold, or jewelry. Had Marian Olszuk ever noticed signs of homicidal activities by the Germans in this 'extermination camp?' His answer was No. Once he had seen a big fire blazing within, but it was a mound of old clothing, about four meter high, in flames. He never saw any burning corpses. All the same, several times he heard, at night, the cries and wailings of women and children that reached his farm. Now and then, he related, a ghastly stench emanated from the camp. Had Olszuk ever heard talk of gas chambers? Yes, he had met a Russian who told him that the Germans used "a mobile gas chamber on rails" (sic). He knew the Germans executed condemned prisoners by firing squad near Treblinka I. In his movements about, the young worker-farmer often happened upon Jews who were housed in the Treblinka II camp. Those Jews worked at various tasks in the woods, supervised by Ukrainian guards who, for their part, often deserted. The food was appalling. His own work, Olszuk told me, was to load, by shovel, small trucks (or wagons?) with sand or gravel, eight hours a day. The work was particularly hard going in the winter cold. Personally he had never seen a Jew being killed. One day, his father gave clothes to a Jew who had escaped from the camp. Convoys of Jews arrived every day. When he was finally called up for work in Prussia, Marian fled, finding refuge in Warsaw, and returned to the farm only after the camps had been shut down. He recalled that common graves were dug up, and that gold and rubies were found among the human remains. Remarkably, after the 'liberation' of Poland and after the war, no administrative or police authority questioned him about what had taken place at Treblinka. After the war there were official commissions of inquiry, which issued extravagant reports, comparable to the Soviet report on Katyn (USSR-008). But none of those commissions ever asked the Olszuks to testify. All the same, the official camp guide, Marja Pisarek, coldly asserted in 1988 that "No one in the vicinity will talk to you". But Marian Olszuk, obviously, was able and willing to talk to us at length, and, unlike another Polish witness, clear-headedly. For our investigation, I had insisted that our small team should bring along a surveyor's chain, which we used for quite some time in taking measurements of the two camps. On the second day of our acquaintance with him, Marian Olszuk, well dressed for the occasion, had agreed to show us, on the spot, the real dimensions of the 'extermination camp.' With a video camera recording it all, we accompanied him from one end to the other. I believe I may rightly say that simply by watching his movements, we observed a real 'man of the soil,' someone who was remembering before our eyes, more than 40 years later, every detail of the terrain. Trees and bushes had grown up where formerly the land was practically bare. When he came upon a tree, sometimes he wondered whether the camp's boundary ran to the left or right of it. It was impressive to observe the weathered farmer stop, reflect, and make his decision. The video recorded those moments. It was in the course of this walk that our man gave us a revelation: the camp had in reality been smaller in size than what the tourists are told. In 1947, after the war, the authorities bought small abutting parcels of land to, in effect, enlarge the 'extermination camp.' The first family to be thus expropriated had been that of Franciszek Pawlowski, and the second, the Olszuks who had only to part with an area of 2,500 square meters. In the attached drawing, made by Tijudar Rudolph with what means we had on hand at the time, one will note the difference in area between the actual camp of 1942-1943, which covered about 14 hectares, and the 1988 camp for tourists, about 23 hectares in size. At the conclusion of this visit of the grounds, Marian Olszuk took leave of us and we, for our part, resumed our work of measuring. It was our intention to go back and see Marian Olszuk a third time, for we still had quite a few questions to put to him. Unhappily, though, there was now a risk of compromising him. The Communist police, who were certainly informed of our activity, might now at any moment take him in for interrogation. Regretfully we decided not to meet again with our guide, who was both providential and unexpected. On the previous day, it should be mentioned, Tijudar Rudolph, Eugen Ernst, and I had dealings with the local police, who held us for an hour's questioning in a room at the railway station of nearby Małkinia. We had in effect been reported for filming the station and some rail cars, comparable in every way to the rail freight cars of the war years. But even though we were not able to meet again with Marian Olszuk, I was to make contact with a 'rare bird,' the famous locomotive driver filmed by Claude Lanzmann in Shoah. "But then, were you aware of taking all those Jews to their death, day after day, and over a period of nearly 15 months?" In other words, to take up the parable of the American revisionist Arthur Butz, Gawkowski was another one of those who, at the time, had not seen "the elephant." He had neither seen it, nor heard it trumpet, but a good while later had become convinced that, in this particular corner of Poland, a monstrous pachyderm had, for nearly 15 months, secretly haunted the area, spreading terror as it went. Enough to make one think that "the elephant" was magical, unless it were only a mirage! To understand that the alleged gas chambers of Auschwitz could not have existed, it is enough to take a look at the very real gas chamber of an American penitentiary. To grasp that the purported rates of operation of the Auschwitz crematory ovens are fictitious, it is enough to inform oneself of the rates of operation, quite real, of the crematory ovens in use nowadays. To see for oneself that the story attributed to Anne Frank is riddled with physical impossibilities, it is enough to visit, with open eyes, the "Anne Frank House" in Amsterdam. 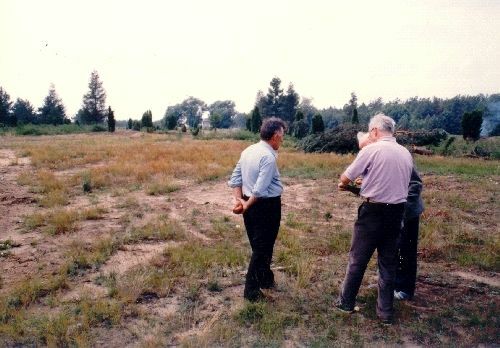 In a like manner, in order to gauge the extent, to which the prodigious secret exterminations and burials of Jews at Treblinka are but a lie, it is enough to cover on foot today the quadrilateral once formed by the camp and to note its modest proportions - about 248 meters by 372 meters by 468 meters by 472 meters. "I had nothing to do with the gassings of Jews either at Treblinka or elsewhere"
It would be entertaining to present, side by side, Jewish and Communist diagrams of Treblinka II, noting that, with regard to the purported extermination structures, they are all remarkably vague and, besides, incompatible with one another. But personally I prefer to spare my readers the repertory of my heaps of files, particularly on Treblinka, giving here only this account of our visit to the camp in the company of a first-rate guide: the Pole Marian Olszuk. 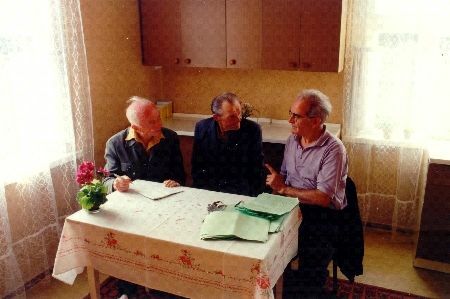 When Jürgen Graf asked me in 2000 for advice in preparing his own visit to Treblinka with his friend Carlo Mattogno, I suggested that he visit me to consult my documents on the subject, and I asked him to get in touch, once at Treblinka, with Marian Olszuk. I sent him some photographs attesting to my encounter with the latter. Unfortunately Graf was unable to come to France and, when he visited Treblinka, he did not question the best of all possible witnesses and guides. I regret this all the more as he might have put to Marian Olszuk the questions left over from the time of my 1988 visit. I am perfectly sure that Marian Olszuk's replies would have been of precious help to Graf and Mattogno in preparing their joint work Treblinka, Extermination Camp or Transit Camp?, first published in German in 2002 by Castle Hill Publishers. In any event, the case is settled. A hundred items of evidence, together with the book by Graf and Mattogno, show that Treblinka II could never have been anything but an ordinary and modest Durchgangslager, that is, a transit camp for Jews being transported to Majdanek, Auschwitz, or other concentration and labor camps, to the south or east. Along with the great lie of Auschwitz, the crude lie of Treblinka belongs, therefore, in the trash can of history. A transcripts of the dialog and descriptions of the stage business can be found in Lanzmann's book Shoah, with a preface by Simone de Beauvoir, Fayard, Paris 1985, pp. 47-49. See my Ecrits révisionnistes (1974-1998), private edition, 1999, vol. II, p. 746. A.R. Butz, "Context and Perspective in the Holocaust Controversy", reprinted in A. R. Butz, The Hoax of the Twentieth Century, 3rd ed., Theses and Dissertations Press, Chicago, IL 2003, pp. 379-407, here p. 392. IMG, vol. VIII, p. 357 or IMT, vol. VIII, p. 325, and document PS-3311. Ecrits révisionnistes (1974-1998) , op. cit., vol. II, pp. 753-755. Source: The Revisionist 2(1) (2004), pp. 78-82. 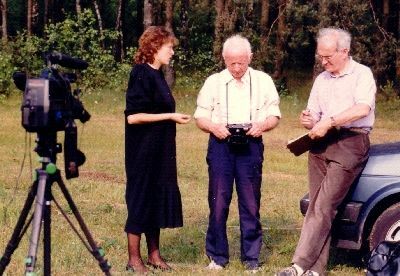 Mariam Olszuk (dressed up), Dr. Robert Faurisson, and Tjudar Rudolph, in Treblinka, June 1988. 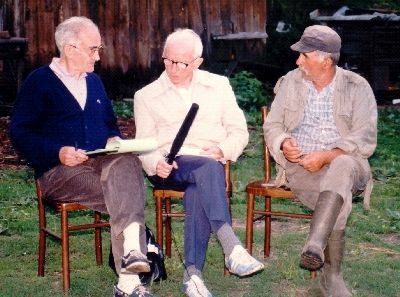 Tjudar Rudolph, Dr. Robert Faurisson, and Wincenty Trebicky, director fo the Treblinka museum, in Treblinka, June 1988.